Tired of drinking the lion’s share of your protein? Try these creative ways of feeding your muscles the same nutrients. Whether building muscle or burning fat, the serious fitness enthusiast should always have a canister a high-quality protein powder staring back at him or her from the pantry shelf. After all, meeting your daily protein requirements is an absolute must for success. Protein supplies your body with all the raw building blocks it needs to repair and rebuild, serves as a healthy and satisfying snack, and helps other systems in your body operate efficiently. But there may come a point where drinking another shake seems about as appealing as a DMV visit. 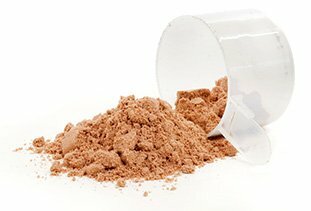 The good news is that there are plenty of creative and tasty ways to use your protein powder without the aid of a blender or shaker bottle. Disliking pancakes seems downright un-American (and I say that as a Canadian), but the normal kind can be a gut bomb. 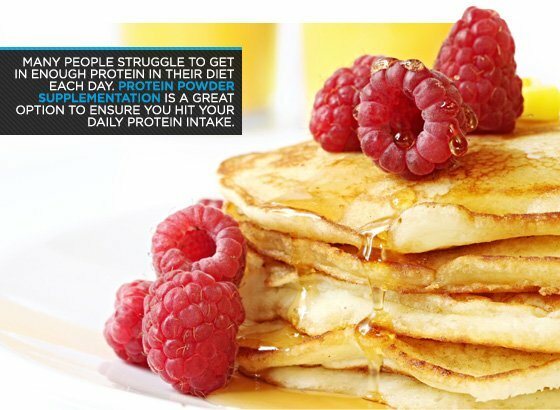 So those craving both good taste and good health should be excited about protein pancakes, which can be made in any number of ways. For a low-carb diet, simply mix one scoop of protein powder with 2 or 3 egg whites and a small amount of sweetener. Pour it onto a hot pan and cook it like you would a regular pancake. This version has only 150 calories per batch and is almost pure protein. Looking to power up the mix a bit? Combine the same scoop of protein powder with 3 or 4 egg whites, 1/4 cup of dry oatmeal, and some Stevia. Pour that mix onto the griddle, and you've got a breakfast made for building lean muscle. You can also smear a tablespoon of peanut butter on top for healthy fats and a little extra protein. Altogether, you'll have a well-balanced and calorie-dense snack with around 350 calories, 42 grams of protein, 26 grams of carbs, and 8.5 grams of fat. You can always adjust the ingredient amounts to fit your own needs! Note: For building muscle, use 3-4 egg whites and add ¼ cup of dry oatmeal. Another simple way to add protein powder to your meals is by mixing it with dry oats. Just place ½ cup of dry oats into a container along with your favorite form of sweetener, add one scoop of your protein powder, pour in one scoop of water, mix it up, and voila! Use more or less water depending on your preferred consistency, but this recipe will form a pudding-like consistency, combining healthy carbs and quality protein in an incredibly convenient snack. For added healthy fats and great taste, add flaxseeds or natural peanut butter. If you're easily lured in by cheesecake but hate what it does to your waistline, switch out the guilty version for a healthy, protein-packed alternative. At just over 200 calories, this treat is hard to beat. To prepare it, take ½ cup of fat-free cream cheese and mix it with a ½ or full scoop of vanilla (or chocolate if you prefer) protein powder along with some Stevia extract. Add milk as needed for a smooth consistency. Serve the mix on top of a whole-wheat or graham cracker. To liven up the flavor, top with a teaspoon of sugar-free jelly or some fresh, sliced strawberries. Tea is refreshing tasty and low in calories, but you might be surprised to know that you can add protein to it and have it still taste great! 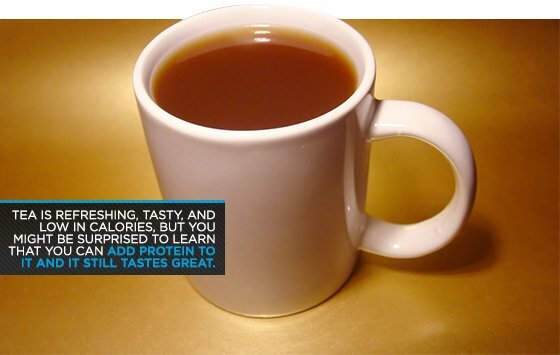 I've got a great chai tea complete with tasty protein. For this recipe, brew your tea as you normally would, but fill your glass or mug only until it's half full. In a separate bowl or container, mix 1/2 a scoop of vanilla protein powder with anywhere from a 1/4 to a full cup of water. Pour that mix into the chai tea, sprinkle some cinnamon on top, and then relax! Chai tea with protein powder is one of the fastest and easiest ways to boost your protein intake for the day without adding any fat or carb calories. Fruits are a tasty, healthy, and refreshing snack to have at any time during the day, but make them more complete and add some new taste by adding some protein powder! This tasty fruit dip combines healthy fats and protein to work perfectly with the carbs and fiber that your fruit provides. To do this, mix a 1/2 or full scoop of protein powder with one cup Greek yogurt and one tablespoon of peanut butter or almond butter. If you're allergic to nuts, substitute one of the nut butters with 2 teaspoons of flaxseed or flaxseed oil. Stir up the ingredients to a smooth consistency, and then place the dip in the fridge until you're ready to serve it. When you're ready, pick your favorite fruit, start dipping, and enjoy! Shakes can get boring just like all the other foods we eat, so keep things interesting by trying new uses for your protein! Note: 2 teaspoons of flaxseed or flaxseed oil is a good substitute.